I'm not sure how fair it is to say a film isn't loved by the amount of Oscars it wins, sometimes it's just a tough year or AMPAS being stupid (because the fact that Philadelphia Story won two Oscars alone just doesn't make sense). 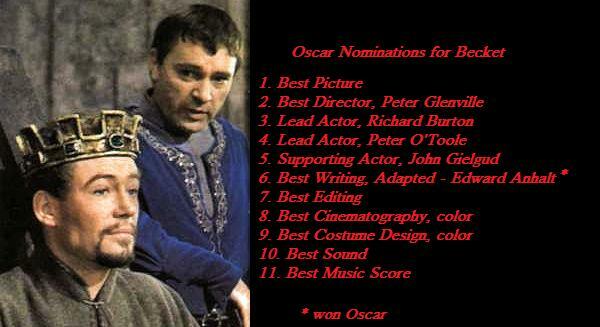 But Becket probably would be here, Oscar or not - even though I think Burton is quite phenomenal. It's nice, though, that Hollywood still makes and acknowledges this old style filmmaking. Becket is a pretty staid picture, but I can't help but love the O'Toole/Burton relationship. It's never terribly filmic but there's still a thrill to had at great actors reading terrific prose on screen. I'm with you on quite a few of these, but I actually don't think The Thin red Line gets a lot of attention outside Malick fans (certainly not as much as some of the other astutely observed choices on your list).